The Fafnir is an Inner Sphere Assault Mech released in 0.5.4. Famed for wielding the most powerful short-ranged weapon available, the Heavy Gauss Rifle and its cousin the Improved Heavy Gauss, the Fafnir makes a terrifying impression on the battlefield. Capable of annihilating any target at close range with one or two strikes, as well as being able to soak up enemy fire in its large quantities of armour, the Fafnir is an excellent choice for assaulting and defending bases in Terrain Control. The mech is not without weaknesses, however. Due to most variant's bias towards short ranged weaponry, the Fafnir is very weak if caught out in the open without support. Along with its glacial speed typical to Assault Mechs, this makes the Fafnir a prime target for LRM users, Bombers and speedy Light and Medium Mechs. Due to the forward placement of the cockpit and guns, as well as a slow torso turn rate, the Fafnir is also susceptible to ambush by Battle Armor, who may use the flat, wide top of the Mech as a platform whilst they tear into it, rendering the pilot completely powerless. The Fafnir Prime is one of the most powerful Mechs available for close quarters combat. Mounting not one, but two Heavy Gauss Rifles, the Prime is capable of destroying light targets such as Light Mechs and Hovercraft in a single shot. Though the Gauss have a long recycle rate between shots, an extra ton of armour allows the Prime to soak up any enemy fire without issue whilst waiting. This variant carries a larger ammo bin than most others, whooping 8 tons of free tons for extra ammunition, allowing more liberal use of the Gauss Rifles. However, this comes at a cost of having meager secondary weapons, only carrying two ER Medium Beam Lasers and a single Medium Pulse Laser to rely on should the ammo bins run dry. Despite the Mechs awe-inspiring power, the short ranged armament and slow speed means that the best tactic to counter it is to simply turn tail and run - The reduced damage of the Gauss Rifles beyond 450 metres is not worth wasting precious ammunition on. A GECM system allows the Prime to remain undetected at range whilst searching for unwary targets, as well as offering slight protection against LRM users. Should your teammates allow enemy Battle Armor get too close, B-Pod will help with its disposal. Stop - "Hammertime!" This variant is one of only two variants in the game that carries the Improved Heavy Gauss Rifle, which allows this variant to attack enemies at a longer range without the damage drop-off characteristic of standard Heavy Gauss Rifles, at the expense of a fraction of the total damage dealt (per/weapon = 800meters 1932damage 6 shots/ton @ 7sec apart). Whilst the Rifles rearm, the Hammertime can continue laying into foes with four Machine Guns, which can also prove useful against aircraft and Battle Armor. However, it carries only 4 free tons of ammunition, meaning that a forward resupply point is needed to be used for extended time on the battlefield. Its build-in case helps with negating gauss explosion and STD engine allows Hammertime soak unbelievable amount of damage, if mechwarrior torso-twists properly. This Mech can crush anything that doesn't suit it's interests practically instantly, assuming it is close enough. Two LBX20s and two LBX10s can destroy light Mechs in a single blast and cripple anything heavier within 450 metres, though loses effectiveness at maximum range. Dual MPLs dish out those last few points of damage needed to score a kill and provide limited backup to the main guns. Though powerful, this Mech is a one-trick pony - it is being dismally short ranged, making it incredibly susceptible to kiters and must be quick to rearm to avoid being swarmed by hungry Light Mechs. Aptly named the ThunderKiss, this Fafnir relies upon a pair of Thunderbolt 20s to deliver pain at distances other Fafnir variants can only dream of. Six arm-mounted MBLs supplement the launchers well, providing much-needed damage between volleys. The C even carries a TAG laser for assisting in guiding its lethal payload to the target. BAP and GECM ensure that even targets running passive radar cannot hide from it. The switch to a missile-based weapon does introduce a crucial flaw to the design: the C has a long window of engagement, meaning a smart enemy will duck and cover as soon as the TBolts are fired, causing them to impact harmlessly into the terrain. 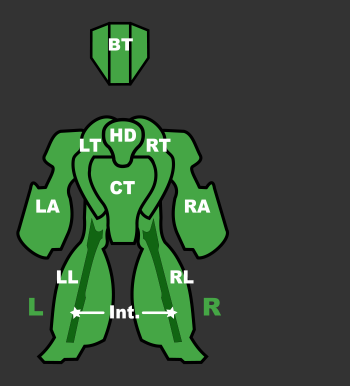 Also, small, fast units such as hovercraft or aircraft can dodge TBolt strikes with relative ease, while larger targets such as assault Mechs often carry a LAMS, which are capable of shooting down TBolts. What was once Undeniably the single most insane Mech created by human hands, the "Scorched Earth" had a unique load-out, to say the least of 8 Flamers but has been reduced to "Three" still allows the Fafnir D to lay down a frightening amount of heat onto enemy targets. Two UAC20s provide excellent close range damage and are this Mech's major weapon system. Backed up by Four SRM2, GECM for stealth and EOptics for battlefield awareness. Seven Double Heat Sinks just manage to control the heat with the aid of Coolant during heavy engagements. Sporting STD engine allows this variant insane survavibility. The bane of this Mech is range - with a maximum of 350 meters, the need for resupply and any Mech with decent ranged weapons and speed can kite the Fafnir and laugh. Whilst most variants of the Fafnir pride themselves in their Ham-handedness, The E variant is a dedicated long range platform compared to it's brawler cousins. Carrying two Gauss Rifles and two ERLBLs, the E variant can wreck havoc on targets up to 900m and 800m away. It completely lacks any backup close range weapons, so Mechwarriors should be wary of closing the distance to enemy mechs. Dual LAMS easily negate any missiles that may endanger it, whilst one Dual Heat Sink help dissipate the heat build-up from the Lasers. All the time scoping the battlefield for it's next prey with EOptics. B-Pod helps with Battle Armor ambushes. With a respectable range of 900 meters the Fafnir F has with Two Extended Range Particle Projection Cannons and Two Hyper-Velocity AutoCannon which can lock any mech, regardless of armor or size- incapacitated with screen-shake and unable to return fire. Four Free Tons keep the HVAC10's well supplied, with the Enhanced Optics to focus your damage- a necessity with how little will be produced. It requires a wise pilot to maintain a consistent barrage, juggling the reloading, ammo consumption and heat with only two Double Heat Sinks and limited Coolant. The 19.5 tons of Armor defending the exceptionally durable STD Engine are more than enough to ensure your reign over the battlefield is long felt. At 122 500 CBills it is the least expensive of the Fafnirs, and has the lowest damage output to match. The Fafnir F straps on two of the hardest hitting Particle Projection Cannons the 2x HPPC with a combined 940 primary/secondary damage output. Anything you hit will be aware of your presence. Bear in mind the long recharge time only provides 5.5 shots per minute. While recharging the four RAC2 Rotary AutoCannons leap into life reaching out to 800m and a fall off at 1000m fed by 4 Free tons. There is enough fire power to wipe out a squad of [[Battle Armor], rip an Aero to shreds or make any variant think twice before advancing. 7 DHS are barely enough to control the heat of contentious fire of the 2xHPPC and 4x RAC2, wise pilots will watch their temperature. EOptics allow a second level of visual magnification enabling a zoom of 2.5x furthering the 4xRAC2 potential. As with all Fafnirs the low speed 54 km/h warrants you travel in a group. The Fafnir is a slow, 100 ton platform for Thor's Hammers - two Heavy Gauss Rifles with four tons of ammunition. The Fafnir was intended to become Defiance Industries of Hesperus' flagship BattleMech. The slow assault design serves as a platform for the pair of "Thor's Hammers". The Fafnir is built on a lightweight Foundation Type 220 Endo Steel chassis that is capable of supporting the Fafnir's massive weapons payload and armor while weighing half as much as a standard chassis. To power this massive 'Mech, a Vlar 300 fusion engine gives the Fafnir a top speed of 54 km/h. The Fafnir is protected by nineteen and a half tons of Durallex Special Heavy V2 armor, giving it almost as much armor as the entire mass of some light 'Mechs. The Fafnir has CASE in both of its side torsos to protect it from secondary damage if one of the Heavy Gauss Rifles are damaged. Finally, for protection from enemy electronic warfare systems, the Fafnir has a Guardian ECM Suite. A Fafnir piloted by Peter Steiner-Davion defeated Nondi Steiner in her 95 ton Hauptmann Assault Mech during a one-on-one encounter in Tharkad City. 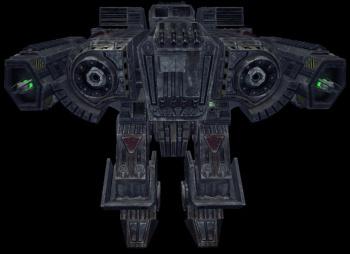 It's possible to win a Fafnir prototype in one of the MechWarrior 4: Mercenaries missions. This page was last edited on 12 March 2019, at 02:57.